At a starting price of just over $23,000, the 2013 Kia Sorento is the crossover that makes the most sense to own. With advanced technology, sporty styling and a spacious interior, the Kia Sorento is the first crossover everyone will want to drive. As this is no ordinary crossover, it deserves an extraordinary road trip. Ready for a joyride? Join us as we take you along on our adventure in the 2013 Kia Sorento. "99 bottles of pop on the wall, 99 bottles of pop. You take one down, pass it around, 98 bottles of pop on the wall," sang the Sun Kissed Family as they made the journey west in their brand new crossover vehicle--and not just any crossover but the very versatile Kia Sorento. They would soon find out just how versatile the Sorento was. Sun, also known as Dad, sang in a reverberating voice. Kissed, being the sweetest mom, of course sang in perfect melody. Out of the three sun kissed boys, #2 sang the loudest, as a middle child should. At around the 55th bottle of pop being passed around, and in between giggles and raspberries being blown, they heard a thunderous BOOM! They looked up at the tilt-and-slide panoramic sunroof and saw nothing but blue skies and sunshine. It couldn't be a storm. "What in the world was that?" asked Kissed, worried. "I don't know," Sun answered, "but I shall pull over and look around." "Be careful, Daddy! It could be an alien spaceship!" said sun kissed boys #1, #2, and #3 in unison. "Alien spaceship. Silly boys," whispered Sun to himself. Sun got out of the vehicle, looked left, looked straight ahead, and looked right. He saw the same thing that they'd been looking at for hours: a desert highway. Sun got back in the Sorento and pressed the push-start button. He was explaining his findings, or lack thereof, to Kissed when the back-up warning system started beeping as he shifted into reverse. There was definitely something out there, and it was behind the vehicle. 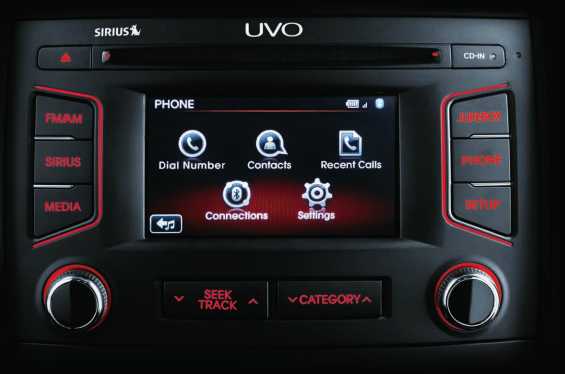 Slowly, everyone's head turned to UVO, the Microsoft-powered, voice-activated, in-vehicle infotainment system. Stunned and silent they stared at the rear-camera display. The sun kissed boys broke the silence when they yelled, "AN ALIEN SPACESHIP!!!" "Now, boys," Kissed calmly said, "do not get out of the Sorento," and secretly she was ever so thankful for the child safety locks. Before the boys even had a chance to argue, though, something else caught their eye in the UVO screen: movement. There was movement. Whoever, or whatever, drove the spaceship was behind the car also! They needed a closer look. Sun backed up the car just a little farther. Just enough to see a little alien hand waving a little white alien flag. "He comes in peace!" exclaimed #1. "He's Friendly Alien!" "Poor thing! He looks hurt," said #2 sadly. Sun and Kissed looked at one another and instinctively knew what had to be done. "Can we fit him in the car?" asked Sun. "Yes. We can fit up to 7 passengers," Kissed responded. "Wait, what about the spaceship?" Kissed asked. "We'll tow it. 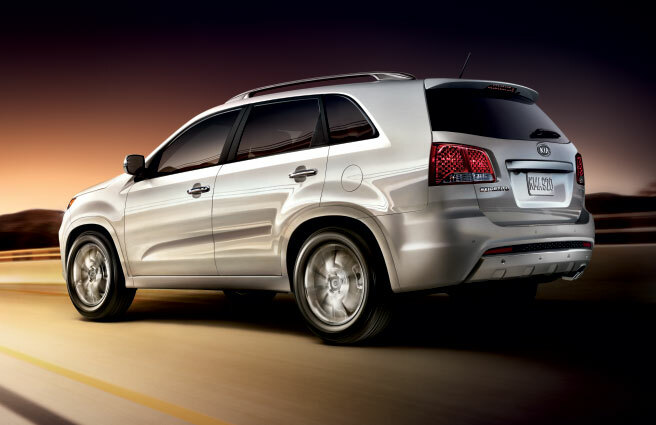 The Sorento has up to 3,500 pounds of towing capacity!" Sun answered. They quickly got out and dragged Friendly Alien in. He was heavy for a being what couldn't have been more than three feet in length. They took advantage of the split-folding abilities in the third row and gently laid the alien down. As Sun hooked up the spaceship to the hitch, Kissed noticed Friendly Alien had started convulsing. #3 came to the rescue saying, "According to my 'How to Help a Friendly Alien Handbook,' we have to cool him down or he could overheat and EXPLODE!" "Yuck! Wait, what? How do you have a 'How to Help a Friendly Alien Handbook'? And since when can you read? You're four years old!" said Kissed incredulous. "No time for questions, woman!" #3 quickly dismissed her. "We have to find a way to cool him down. Put Friendly Alien in the driver's seat and turn on the air-cooled seat system." Kissed asked, "Do you think that will work?" "It should. The seat features perforations that allow air to circulate," answered #3. "Did you just quote the 2013 Kia Sorento brochure?" asked Kissed, surprised. "Why, yes I did!" answered #3 nonchalantly. #3's idea, of course, worked. Friendly Alien's temperature went down and he seemed to be resting comfortably. So back to the folded third-row seat he went. However, his comfort didn't last long. "I think he's bleeding something green and gooey," said #2. "Oh no!" gasped Kissed. "Open up the concealed compartment under the cargo floor and grab a blanket. After all, we don't want to get the car dirty." #2 did as his mom told him. The Sun Kissed Family knew the situation was getting worse. They had to do something right away. "What does your manual say now, genius child?" said #1 to #3 sarcastically. Without missing a beat, #3 said, "It states that the injured alien must be taken to the nearest hospital, otherwise he will EXPLODE! The alien body must be smoothly transported. Any more jerky movements and he could EXPLODE! Any more loud noises and he could--" "EXPLODE!" interrupted Sun. "We get it." "Can we make it?" asked Kissed. "Of course we can," chimed #3. "This vehicle is American-assembled! Thanks to its unibody design, the Sorento rewards you with an exceptionally smooth and quiet ride matched by precise handling on curvy roads." "Are you seriously quoting the 2013 Kia Sorento brochure again?!" asked Kissed. "Yep," said #3. Kissed couldn't help but ask, "Who are you?" The story above is fictional and the creation of the writer. Any similarities to real-life events are purely coincidental. It is obvious that the Sun Kissed Family crossed over to the unexpected. What adventures will you and your Kia Sorento find? 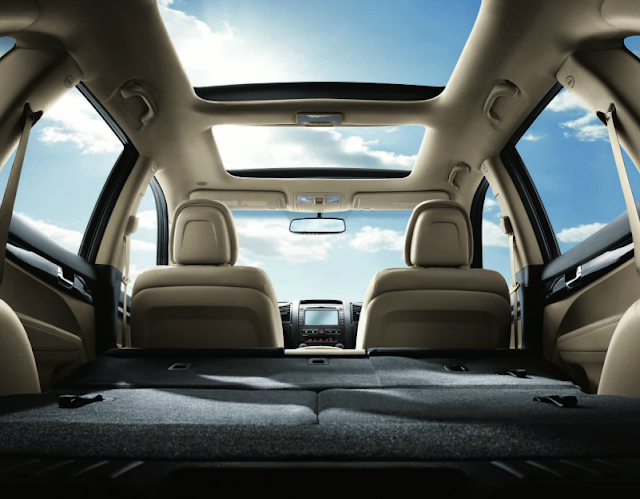 What is the most unexpected feature of the Sorento for you? This sweepstakes runs from 7/26/12-8/5/12. 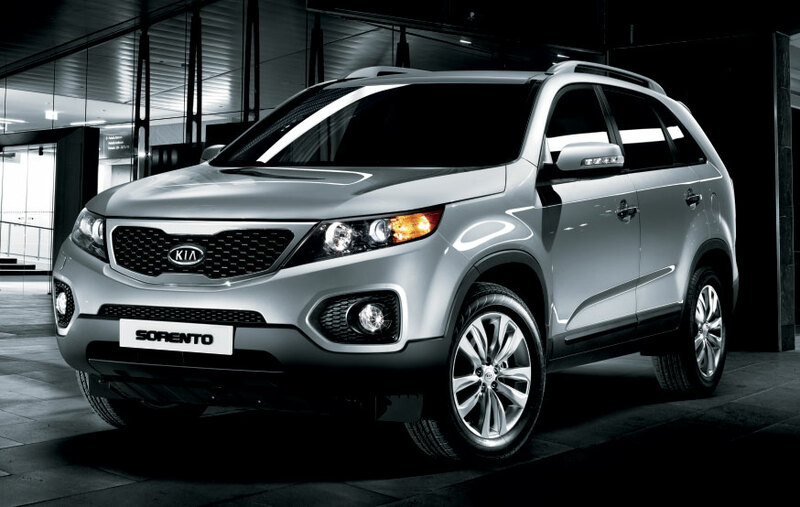 Be sure to visit the Kia Sorento page on BlogHer.com where you can read other bloggers' posts! That tilt & slide panoramic sunroof is AMAZING!! An air conditioned SEAT??? Are you serious? That would be HEAVEN! The fact that it is assembled in America was unexpected for me. I also love the tilt & slide panoramic sunroof-it is like bringing the outdoors in!!! Loved the Story! How fun! I Love that this car is assembled in AMERICA!! Living in the hot and sultry DC area the AIR CONDITIONED SEAT would make my commuting so much more enjoyable. Now, can they add something to deal with drivers who have no idea what a turn signal is for???? Wow! Air cooled seats for sure! Hands down, the a/c seat!! Air conditioned seats would be a dream come true here in Louisiana!! Air cooled seats sound pretty fantastic. It's been near/at one hundred degrees for three weeks this summer! Wow!! !Any North Carolinian NEEDS air conditioned seats!!! The concealed storage compartment is great! it is very roomy- surprised that it will seat 7! Concealed department under the cargo floor! I like the air conditioned seats. WOW! I loved your story! It was hilarious! I really like the air cooled seats, too! I like the push start. Love that feature! Wow! I'm love'n the tilt-and-slide panoramic sunroof! Talk about luxury! Plus I'm loving that the back seats aren't cramped! Wow.. I want one of these.. Love the panoramic sliding roofs but the air cooled seats was what sounded the best to me.. I live in Mississippi and have been riding around with no A/C for the last couple of weeks,, and its been HOT. i like the mirror finish wheels....one can be sure to be stylin and profilin! The Infinity Surround Sound and 10 speakers....10! Wow! The most unexpected feature is the voice activated system that allows you to use the GPS and cell phone legally while driving. I definitely love the air cooled seats!! I'm so used to getting in the car and getting burnt by the hot seats!! The power folding side mirrors look really nice, it'd help when I park too. Thanks for the review and giveaway. 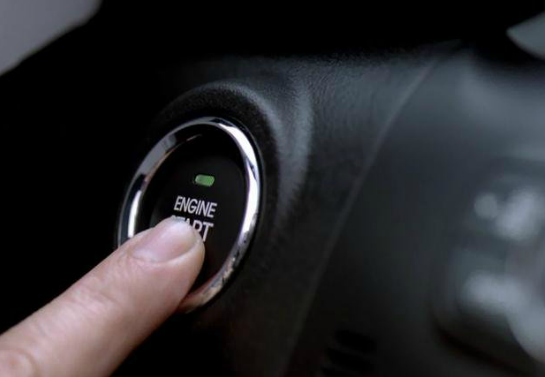 I love the push button start! The button start is fun...No more keys!!! It's pretty awesome that the second row seats fold as well as the third row. That equals more room for garage sale and thrift store finds. i love the 3 rolls of sit it look big and alot of room for everyone.